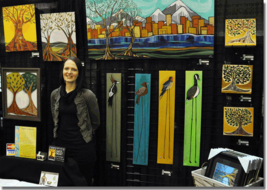 Craft Shows in Maine 2019–2020. 26th Annual Christmas Craft Show at the Augusta Armory located on Western Ave Rt 202 across (from Burger King) below the airport. This show is open to all crafters that make their own work. Give a gift with meaning, give a gift of quality, give a gift made in the USA at our craft show at the Augusta Armory. Purchase all your Christmas gifts in one place. We're always looking for quality artists and craftsmen.